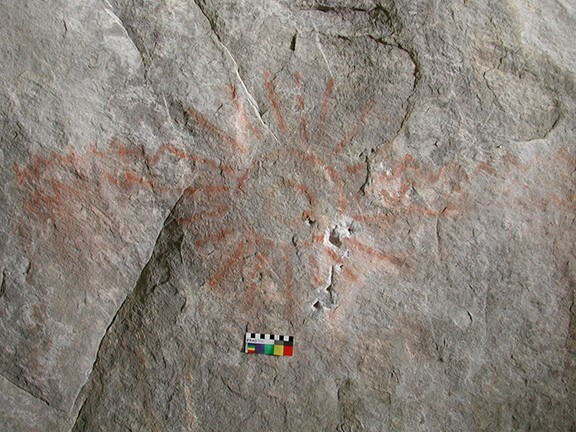 The sunburst is a common rock art motif that we also find as a decoration on ceramics and basketry. Edward Green, of Clarksville, Arkansas, authored the first published report on Arkansas rock art in 1883. In The Annual Report of the Board of Regents of the Smithsonian Institution … for the Year 1881, he described a series of petroglyphs inscribed on the walls of a local rock shelter and speculated that the images “must have caused this place to be held in reverence and awe” by the ancient people responsible for their creation. Later visits to rock art sites by professional archeologists in the early 20th century, including M. R. Harrington from the Museum of the American Indian in New York and Winslow Walker from the Smithsonian Institution, prompted Samuel C. Dellinger, curator of the University of Arkansas Museum, to investigate a series of Ozark rock shelter sites during the 1930s. One of Dellinger’s primary goals was to preserve for the direct benefit of Arkansas’s citizens the tangible indicators of our state’s prehistory. As part of this effort, his team identified and described additional rock art images, but offered little in the way of interpretation. The most extensive early 20th century survey of rock art was conducted by Dr. T. R. Hardison, a physician who recorded the locations of hundreds of pictographs near his home on Petit Jean Mountain. Hardison ventured some of the first scientifically informed interpretations, and he even consulted with professional archeologists including Dr. Clark Wissler of the American Museum of Natural History. Hardison’s legacy is the subject of continuing investigations by Donald P. Higgins, Jr., a current resident of Petit Jean Mountain and Arkansas Archeological Society member. These studies helped draw attention to rock art as an important component of our state’s archeological record. Human-headed serpent representing a mythic scene, from the Arkansas River Valley. Gayle Fritz (ARAS-UAF research station assistant) and Robert Ray (ARAS-ATU research station assistant) conducted the first Arkansas Archeological Survey investigation of rock art in 1978–1979. They visited most of the 46 rock art sites then recorded in the Survey’s site files. Fritz and Ray identified four distinctive areas of rock art distribution across the Ozark Highlands, and suggested a late prehistoric dating for many of the images based on comparison of rock art motifs to decorations on ceramics and engraved shell. 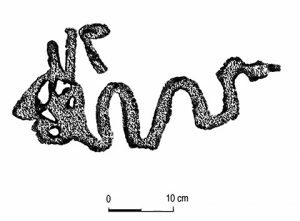 They defined the Petit Jean style of pictographic rendering for a series of images in the central Arkansas River Valley, and offered modest inferences concerning the purposes for which ancient American Indian communities produced those images. Perhaps their enduring contribution was the successful nomination of 28 rock art sites to the National Register of Historic Places. P. Clay Sherrod, working for the Office of Research in Science and Technology at the University of Arkansas-Little Rock campus, built upon the Fritz and Ray survey by conducting an intensive survey of rock art sites in the central Arkansas River Valley from 1981–1983. He described pictographs and petroglyphs at 492 locations, organizing the image data by motif category and style and summarizing additional information on site setting, site condition, and associated archeological materials. Prehistoric pictograph of a fiddlehead fern. Jerry Hilliard (ARAS-UAF station research associate) continued to build upon our understanding of Arkansas rock art by conducting thorough assessments at several rock art sites throughout the 1980s and 1990s. His 1995 excavations at The Narrows rock shelter—an important petroglyph site on Ozark National Forest lands—was the first time that a rock art site in Arkansas could be linked to an archeological culture; his analysis demonstrated that The Narrows rock art was associated with a Spiro phase occupation radiocarbon-dated to ca. AD 1435. Ceremonial dance scene from The Narrows site. 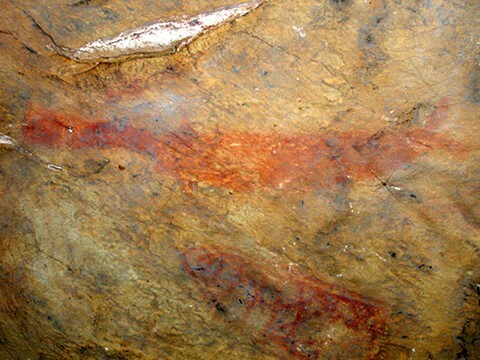 Read more about this panel on the Rock Art website. Paddlefish (above) and trap (below) pictograph on Petit Jean Mountain. Find out more on the Rock Art in Arkansas website. These studies, along with a rock art documentation workshop conducted in Petit Jean State Park by Linda Olsen in May 2000, led to the development of the Survey’s long-term Arkansas Rock Art project. Generous support from the Arkansas Humanities Council and the National Endowment for the Humanities made it possible to conduct detailed surveys and to assemble extensive documentation for more than 100 rock art sites. 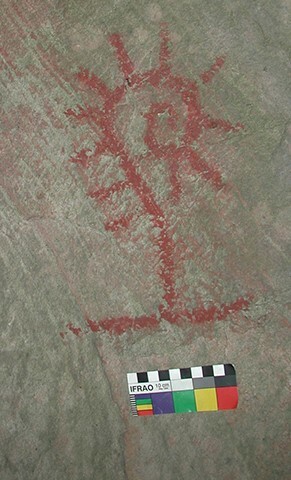 Publications issued to date examine rock art as an expression of ancient American Indian religious belief and ritual practice, relationships between rock art sites and other components of ancient cultural landscapes, and stylistic ties between rock art and other artistic genres, including decorated ceramics, embossed copper, engraved shell, and woven basketry and fabric. These findings advance our understanding of the important role that art played in ancient American Indian communities in Arkansas and the South. Additional information on American Indian rock art in Arkansas, accompanied by a searchable image database, is presented on the project website archeology.uark.edu/rockart/.